Back in January when my sister and brother-in-law visited and gave us a couple of game expansions for Firefly: The Game, I was inspired by the two new ships that came with Pirates & Bounty Hunters and thought about creating a couple of other new ships. So, in discussing it, my brother-in-law and I came up with two new ships for Firefly The Game, which are physically quite easy to create. 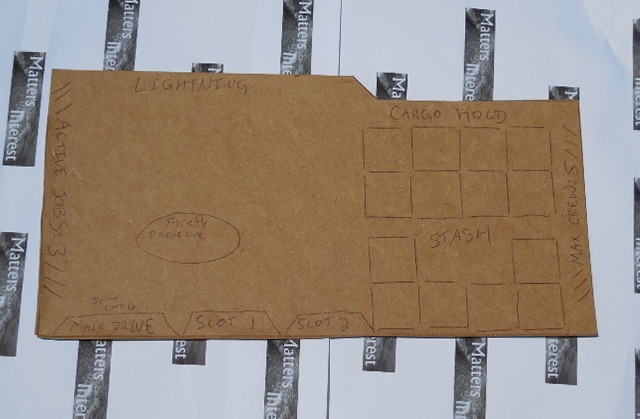 To create them, since the height of the cards of the ships are are the exact same height of a box in which twelve 12-ounce soda cans are sold, we just used some of those boxes and traced them out. The first ship we created we called “Lightning”, since it could go faster than a normal ship, with the ability to go six spaces on a fuel burn. However, it had some trade-offs on account of its speed. While it had a standard cargo hold of eight, it had a maximum crew of just 5 and only 2 slots for ship upgrades. However, we made it also have 6 in its stash instead of the standard 4. So, this ship is meant to be somewhat lighter and faster, with some crew quarters being given up in favor of a larger stash, although not a lot faster. The next ship had quite a few modifications, with it primarily oriented towards passengers, so we gave it a working title of “Passenger Liner”. 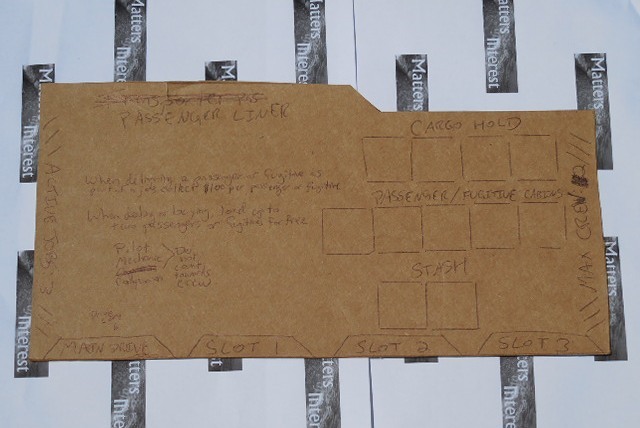 On account of this priority towards carrying passengers, it has only four spaces in its cargo hold and only two spaces in its stash, however, it has five spaces for passengers or fugitives, since that is its main function. Since it is mainly for carrying passengers, it has a drive core of 6 spaces per fuel burn and a full three spots for ship upgrades. A couple further modifications we made to the ship were that when delivering a passenger or fugitive, the player gets to collect 100 credits for each one delivered. Also, a really fascinating feature we made was when dealing or buying, the player gets to load up to 2 passengers or fugitives for free. The final modification, however, is a really amusing one: while the maximum crew is merely two (yes, just 2 crew), pilots, a mechanics, and companions do not count towards crew, so one could actually have many crew members on this ship (although, as my brother-in-law points out, even if you have multiple pilots, multiple mechanics and/or multiple companions, “you’ll have to pay them and you’re paying for a lot of redundant keywords”). While I have not yet played with these new ships yet, I am looking forward to trying them out and seeing how they perform.